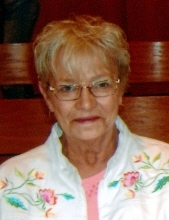 Funeral services for Joyce E. Fortin, 77, Aberdeen, SD, are 2:00pm, Saturday, April 13, 2019, at Bethlehem Lutheran Church, Pastor Kevin Bergeson officiating. Burial at Fairview Cemetery, Northville, SD, at a later date. Joyce died Saturday, April 6, 2019, at Bethesda Home of Aberdeen. Visitation is 3:00-7:00pm, Friday, family present 5:00-7:00pm, and a prayer service at 7:00pm at Spitzer-Miller Funeral Home. Joyce E. Bebo was born on July 5, 1941, to John and Alphena (Anderson) Bebo near Turton, SD, in Spink County. She grew up in Brown County where she attended country school. On January 22, 1959, Joyce married Maynard Fortin at St. Bernard’s Catholic Church in Redfield, SD. They lived in numerous communities before making their home on a farm near Mansfield, SD in 1964, where they worked together; taking care of animals, packing silage, and baling hay. They moved to Bowdle, SD in 1985, where she was a cook at the Senior Center. Later, she worked for the nursing home until retirement. In 2014 she suffered a stroke and resided at ManorCare, then Bethesda. Joyce loved her family! She enjoyed cooking for them and enjoyed family gatherings, especially for the holidays. She would often get together with friends to play Farkel and never missed an opportunity to send a greeting card. Joyce enjoyed gardening, planting flowers, and had a soft spot for animals. She will mostly be remembered for her radiant smile and infectious laugh. Grateful for having shared Joyce’s life are her husband Maynard Fortin; children: Mike Fortin, Dawn (Garret) Hall and Kim (Weylin) Huber; grandchildren: Jason Trevor, Matthew (Jenna) Trevor, Tyler (Jackie) Schuchhardt, Danielle Carlson (Kendel Simon), Melissa Understock, Michael Fortin, Amanda Fortin, Trevor Siebrecht, Nicholas Huber, Miranda Huber, and Breanna Huber; great-grandchildren: Caleb, Jackson, Abigail, Bennett, Ashton, Haivyn, Tyton, Isabella, Logan, Hailea, Avery, Caitlyn, Tanner, Maisie, Rylan, Mallory, Mason, Dillyn and Joshua; and brothers, Richard (Darla) Bebo and Ronnie & Faye Bebo; and son-in-law, Gordon Schuchhardt. Preceding Joyce in death are her parents, John and Alphena Bebo; step-mother, Clara Bebo; daughter, Deb Schuchhardt, grandchildren, Cody; great-grandson, Evan Fortin, and brothers, Robert and Gary Bebo. To send flowers or a remembrance gift to the family of Joyce E. Fortin, please visit our Tribute Store. With Family Present From 5:00 - 7:00 PM. "Email Address" would like to share the life celebration of Joyce E. Fortin. Click on the "link" to go to share a favorite memory or leave a condolence message for the family.